ABAIM: Apre zis enn mwa! Enn mwa tusel inn passe depi ki nou'nn ouver nou blog! ala seki lasosyasyon Abaim ete! ki u dir? serye pa serye? Zwenn nu u osi pu sa gran lanrisisman limanite la! - To our 271 Friends, Sympathizers – thank you for the support you are bringing us just by clicking the mouse..
- To the Unknown people – thank you for reaching out to us. 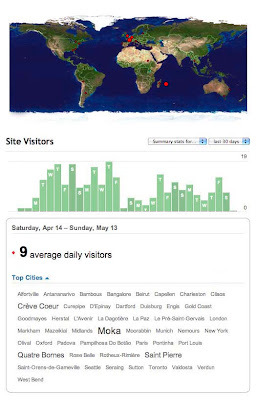 More than 600 visits to-date is more than we expected. - To the People who left a comment – thank you for blowing on this fire, helping to keep it alight. We cannot wait to hear from you again. - To Daniella, Alain - thank you for your enthusiasm, commitment and your enlightening posts - 12 , an average of 3 posts per week . Fantastic ! as I know how that 24 hours a day is barely sufficient for people who have so many obligations like you. - To Tyeri – thank you for your enthusiasm and sensitivity. And above all thank you for being a creative with no regular office hour ! A night owl getting the job done in the shadow hours ! - To our Members – thank you for giving us food for thought , thus nurturing the blog. - To Humanity – thank you for letting us believe in you.